This Retail Satisfaction Guaranteed But No Tipping Please sign suggests that the extra service does not involve any extra charge or gratuity. 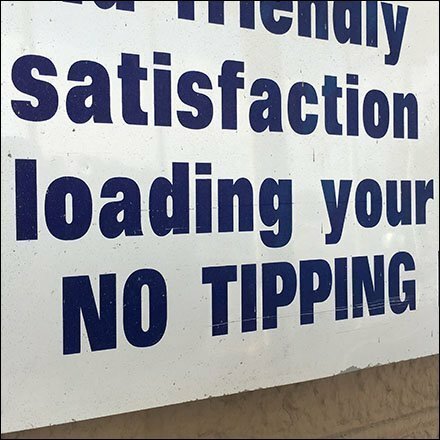 I might recommend “No Tipping Required” instead because there are times when the order is so troublesome, and staff assistance rendered so helpful and beyond the call of duty, that a tip is actually merited. For any who care to break this signed regulation, try cupping the money discretely in the palm, and shaking hands while thanking the staff. I find most get the hint, and the tip is delivered without management’s knowledge. Staff gets a reward and added motivation. I get even better service the next time I shop. This Retail Satisfaction Guaranteed But No Tipping Please restriction seen at Lowes. Don’t tell them my wife and I sometimes violate corporate policy.